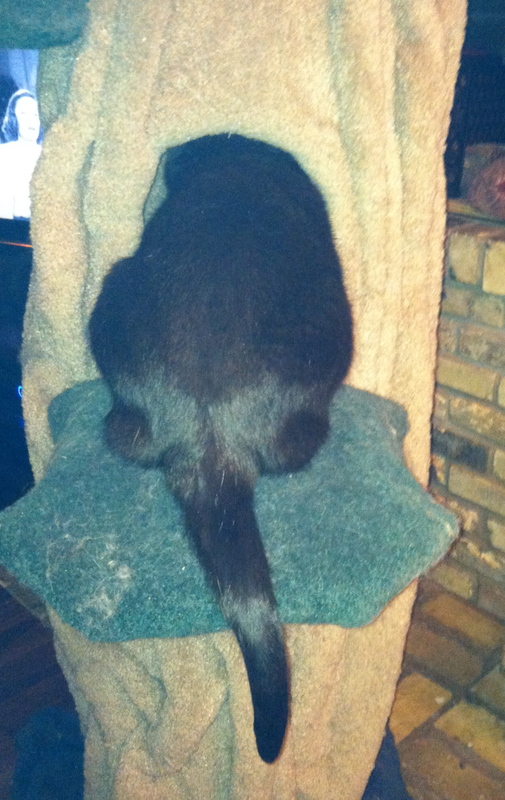 I’m glad I only paid $8 for this cat scratcher. I brought it home last Tuesday night, pleased with my remainder-table bargain. By Thursday afternoon, it looked like this. In a household of many cats, you might think I had to guess at which feline(s) were responsible for this senseless destruction. I did not. I knew. Marlowe and Monty, the M & M boys, are solidly living out their kitty adolescence and have decided to pursue the hoodlum path. I have had kittens and young cats around the house off and on for years, so I’ve learned not to leave glassware out; pens and pencils, ditto, as they make great spinning cat toys that can disappear into the smallest of nooks and crannies; jewelry must be securely hidden away, especially anything with a chain; and there is no way on Bastet’s** green earth that I will ever be able to have healthy houseplants again. Until these two appeared, though, I had never experienced undue destruction of cat toys. 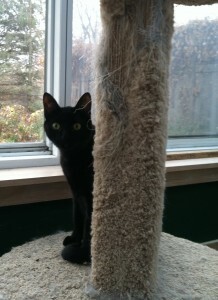 Sure, the carpeted cat trees look threadbare after a while, and the little furry battery operated animals that squeak fall silent after being dropped in the water bowl. That’s part of the cost of doing business with cats. Monty, on a self-imposed time out. 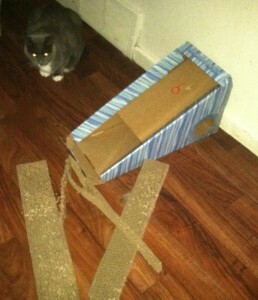 This cardboard cat scratcher surprised me. You’d think they wouldn’t normally be that durable, but I’ve had several of them and they’ve all lasted several months, if not years. I expected the cardboard frame to be pummeled but I never dreamed that they would rend the corrugated scratching surface into two parts. I guess this means it will be a flippant waste of money to have a Christmas tree this year.